The state lifted its ban on a local assisted living facility flagged for safety issues Tuesday – allowing Inspired Living at Sun City Center to once again admit new residents. 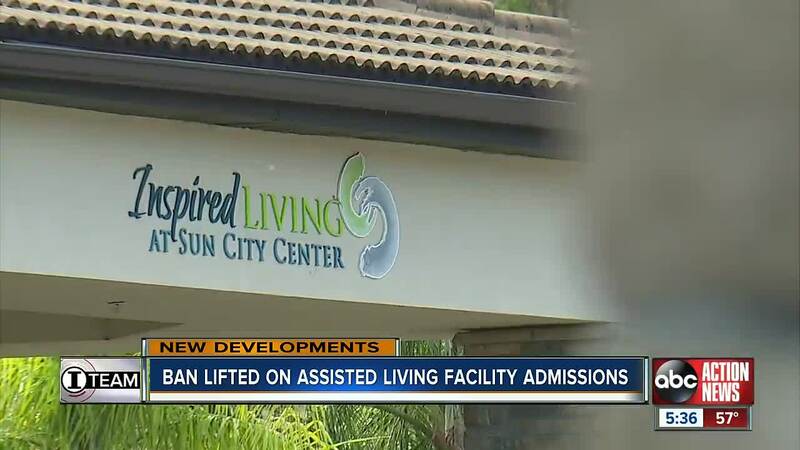 SUN CITY CENTER, Fla. – The state lifted its ban on a local assisted living facility flagged for safety issues Tuesday – allowing Inspired Living at Sun City Center to once again admit new residents. The move comes after a state investigation last month found incidents of sexual assault and violence by residents against other residents. Florida’s Agency for Health Care Administration (AHCA) has been monitoring Inspired Living since it imposed a ban on new admissions on Dec. 5. In an order lifting the ban this week, the state hit the facility with $26,000 in fines and fees as part of a settlement agreement. I-Team Investigator Kylie McGivern was the first to report on the state’s order last month and learned what the facility must do going forward. According to the agreement, Inspired Living must hire an independent consultant for the next two years to evaluate the facility’s operations every three months. The facility has previously said it has since removed three residents identified by the state for inappropriate behavior. Monday, the I-Team reported on a gap in state law , revealing Florida assisted living facilities are not required to call family members when state regulators find safety issues like those at identified at Inspired Living. It’s something Clearwater attorney Peter Sartes, who regularly represents victims of assisted living abuse, warns about. The settlement agreement does not prevent the state from revoking Inspired Living’s license if they find problems in the future. Our entire team at Inspired Living worked diligently and quickly to address the State’s concerns. We are pleased they have granted us full admissions rights. We will continue to work closely with the State of Florida to remain in good standing and to continually revisit and improve our policies and procedures so as to implement industry-wide best practices and provide the highest quality of care to our seniors. You can find the I-Team’s full investigation here , including information on how you can check inspection reports on assisted living facilities in the Tampa Bay area.